Recently I had the opportunity to talk with Denise Baron, Vice President of Food and Beverage for Burton's Grill, about their restaurant's popular gluten-free menu. Denise is also a co-founder of the restaurant, which opened its first location about 5 1/2 years ago. Burton's Grill currently has SIX locations: Boston, MA; Hingham, MA; North Andover, MA, Peabody, MA; South Windsor, CT; and Virginia Beach, VA.
Denise is extremely knowledgeable about Burton's gluten-free menu, since she was instrumental in introducing it while in her former role as Executive Chef 4 1/2 years ago. It was after learning that Burton's President/CEO Kevin Harron had Celiac Disease that she proposed making their own menu more accommodating to people avoiding gluten. She wanted to make sure people with Celiac could "order off the menu and not feel singled out." Because Burton's Grill is a "from scratch" kitchen, knowing exactly what ingredients are in their menu items -- and how to tailor them to be gluten-free -- was much easier. In fact, Denise reported that much of the menu was already gluten-free. Two big adjustments she needed to make were switching to LaChoy soy sauce for any dishes requiring soy sauce, since this brand is gluten-free. She also switched from a chicken stock that contained gluten to a gluten-free vegetable base for her homemade stocks (for risotto, for example), which also makes it a suitable choice for vegetarians. Improving people's gluten-free dining experience is always top-of-mind at Burton's Grill. Denise and her team are constantly trying to "seek out better gluten-free options to give people as many choices as possible." Denise imports a special gluten-free pasta from Italy which is nearly indistinguishable from "regular" pasta, and Burton's makes sure gluten-free diners at Burton's Grill get a "real burger" experience, complete with a gluten-free bun. They serve Kinnikinnick buns and Gillian's dinner rolls. Unlike some other restaurants that charge a premium for gluten-free meals (due to ingredients that can add up to 40% to the cost of a meal), Burton's Grill doesn't pass these costs on to their gluten-free customers. And they've found it's smart business. 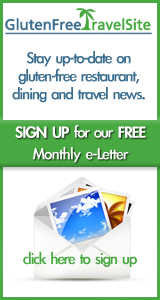 After all, as many people know, the person who is gluten-free is usually the decision-maker when dining out in a group. Because they only have a limited number or restaurants where they can get a "safe" meal, their needs and preferences are the determining factor on where to dine. Feedback on Burton's Grill's gluten-free menu has been fantastic, and the restaurant overall has benefitted. Denise reports that some of their most popular gluten-free menu items at their restaurant are the fried foods, since good gluten-free fried food is very hard to find when dining out, due to the need for a dedicated fryer for all gluten-free items. Burton's Grill is able to offer gluten-free calamari as well as gluten-free fish and chips. Other popular items from their gluten-free menu include their Stuffed Zucchini appetizer, their Mediterranean Salad, all their Burgers, and their gluten-free Ribs. New items are added to their menu every month or two, inspired by the season and the availability of fresh New England seafood. The shrimp and lobster duet is currently a big hit, and they've also been offering a gluten-free strawberry shortcake (using gluten-free biscuits) this summer. Despite the truly extensive choices on both their Gluten Free Lunch and Dinner menus, Denise would like to expand their gluten-free dessert offerings with more items made in-house. Currently, the choices include a Vanilla Bean Creme Brulee and a Warmed Chocolate Torte (YUM!). Denise is personally responsible for staff education, training, and development and takes the issues involved with offering a gluten-free menu very seriously. They are 100% committed to the gluten-free market (as well as catering to guests with other allergies), as you can read about in their Food Allergy Commitment. To further serve this "underserved" market, Burton's Grill has started promoting Gluten Free Wine Pairing Dinners. They've been even more successful than their "regular" Wine Pairing Dinners, with both gluten-free diners and their dinner companions raving equally about the food. Burton's full gluten-free lunch and dinner menus are available at all six of their locations. If you live in or are traveling near any of their Massachusetts, Connecticut, or Virginia locations, be sure to visit this very unique restaurant. And they do have expansion plans, so perhaps they'll be coming to an area near you soon! I'd sure like to see one in the Washington, DC market!